Jules Verne's 1869/70 novel, "Twenty Thousand Leagues under the Sea," contains a reference to a captain Nemo, playing an organ installed on his ship Nautilus. Turning Verne's fiction to fact took a little time: at first harmoniums and grand pianos sailed with such ships as the Cunard line's Campania and Lucania (both 1893). Campania even had a false pipe display to make its harmonium look like a pipe organ - a not uncommon ruse. Around the turn of the 19th/20th centuries serious competition developed for the best on-board musical entertainment, endowing the great luxury liners of the early 20th century with the latest and best. Player pianos became relatively common. After the disaster of the Titanic, the provision of such instruments even became something of a distraction. In their catalogue of 1913/14, Welte identified and illustrated a number of piano and organ installations, including their Welte-Mignon, orchestrions and their Philharmonie, aboard yachts and ships. Their New York branch had also installed an orchestrion aboard the Pocahontas, an American river boat. Claimants for the title of "Titanic organ" are all orchestrions. Since they survive, then the rumour that an organ was delivered too late to go aboard is given some substance. The largest ship's organ ever built was the Britannic organ now in the Seewen Museum, a Welte Philharmonie which was made for this sister ship to the Titanic, although the instrument never sailed with its ship. Others, e.g. on vessels of the White Star Line or Lloyds, or on private yachts - such as Howard Gould's steam yacht Niagara, which featured a Philharmonie - are chronicled. The Aeolian company was also involved in ships' organs: originally it was mooted that the Britannic should have an Aeolian instrument. However, like the Titanic's Philharmonie, this was not to be. Some special corners of human creativity are devoted to our constant battles with the four elements - water, air, fire, earth. This has been the subject of many works of literature, paintings, sculptures, photographs and music. The great steamships of the early 20th century linked all four of these elements, one way or the other. At the same time, throughout the 19th and into the 20th centuries, a new cultural aesthetic in the form of a "dynamic" romanticism gripped the western world: painters, poets, novelists and composers related dramatic stories of sailors, explorers, adventurers and heroes through art in all its forms. They created a zeitgeist which excelled in the expression of concepts such as conquest, upheaval, longing and aspiration. A pre-occupation with death is also noted, especially musically in the proliferation of Requiems around the era of Berlioz, Fauré and Brahms. The Gothic was revisited, and became a trend in novels with knights, warriors, dragons and rescued damsels. This was a dark and gloomy 19th century Gothic. In literature, Ruskin, Dickens and Conan Doyle were amongst the more outstanding representatives. Similarly, from organ and orchestral "Storm" genres, through the Titanic story, notions of rescue, physical or religious, was a central theme: human hardship, natural fear and enduring fascination combined to inspire countless stories of daring deeds and great works of art were dedicated to humans pitted against the elements. Wind, warm or cold, calm or cyclonic, and water, ice or steam, held particular dangers, providing sometimes unassailable forces leading to inevitable catastrophes including, and especially, shipwreck. When all else failed, God was conjured into the arena. But wind- and animal-power was set to yield its place in this new era of even greater elemental forces - fire and steam - all harnessed by inventive humans for their own increased comfort and safety. Especially at sea. These CDs contain music fitting to this zeitgeist with its changes in attitudes, technology and mobility. They reflect on human reactions to all aspects of the planet's constant and unpredictable bouts of animosity towards its living creatures, but especially through wind and wave. The stories around Titanic and Britannic represent a Promethean struggle between raw human danger and indulgent comfort as people were transported, sometimes in sheer luxury, between continents. An organ aboard a ship is purely for entertainment purposes and has nothing to do with navigation or safety - it is merely a distraction and helps draw attention away from the fears and phantoms of dark and dangerous oceans or treacherous, rocky coastlines. A shipboard organ also symbolized power, prestige and wealth as passengers listened, or even danced to its music in an interior brightness brilliantly lit by steam-generated electricity. All this while icebergs and other dangers lurked in cold and murky waters outside. The music could turn religious when the presence of God was felt to be needed, especially when danger was perceived, or the worst actually happened. So these CDs contain a mix of joyful and solemn music, hymns, dance and entertainment genres that revolve around life and death aboard ship. It is assumed that, had she not been a victim of war, Britannic would have been in service well into and through the 1930s. Thus the selections include classical music, lighter items, dance music, cinema and shipboard hymns. The musical selections thus stretch through all possible shipboard tastes and forms that might conceivably have been used and heard aboard Britannic had she ever plied the oceans as a passenger liner. This piece in itself needs no introduction: Bach's - probably the world's - best-known organ work, even if it is sufficiently atypical of the composer's normal style to invoke questions as to his true authorship. It has, however, prime place on any CD of ships' organ music simply because of its indelible association with the organ aboard Captain Nemo's ship Nautilus. The music progresses from the thunder and lightning imagery of its opening Toccata through the unusual fugue with what some describe as a violin-derivative theme, some unique echo sections, then back to the thunder and lightning of its opening. In a seemingly symbiotic relationship this dramatic work, chosen for its popularity, becomes even more popular through the Verne novel's cinematic adaptations where it is invariably chosen. In 1904, well before Titanic's sinking, the hymn was reported to have been sung by women aboard a dinghy escaping the wreck of Valencia off the coast of Canada. The tune they used is not recorded. The account of this event is thought to presage the Titanic disaster or even to have become confused with it. Composers have used a variety of these tunes in Titanic-related musical works. Whether none, one, or more hymns were played by the Titanic band is unclear, but if any was played, then the likelihood of Horbury being used - as it was for Bonnet's work featured in the next track on this CD - is almost a certainty. The film industry confined itself to just two: the Americans tended to favour their own tune (Bethany) and the British theirs (Horbury). Thus the sheer inertial mass of Hollywood has possibly caused the wrong tune to be popularly linked to this story. The earliest significant work commemorating Titanic's sinking uses the tune Horbury. Bonnet's choice of this is interesting - he would probably have needed to do research into the question of the tune used, since there were quite a few already associated with this hymn by then. British hymn culture is not known to have been a part of Bonnet's upbringing or religious background. In Memoriam Titanic was written immediately after the disaster on 12th April 1912 and recorded by the composer on, or very shortly after 6th February 1913 at the Welte premises in Freiburg. This is the only recording of the composer himself playing this work. It unfolds like a Greek drama, full of symbol and seriousness of purpose, not unlike a requiem in its own way. An almost constantly-operating Tremulant adds to the feeling of Greek pathos, and mournful solos on stops such as the haunting Clarinet, or "classical" recitative-like moments, all add to this mood of ancient tragedy. The minor ending to a piece beginning in the same major key also effectively underlines this. A delightfully romantic fantasy (or was it?) can be found in the notion of the lost city of Atlantis. Related to this came concepts of submerged buildings and streets, of houses under the waters and even a cathedral. Debussy's evocative work, originally for piano, uses references from medieval music to help conjure up tone-images of a long lost era. Whether ten Cate recorded it onto roll first as a piano work, then re-cut it for organ is not clear. Transfers from piano rolls to organ were common in the early days of the Welte Philharmonie, but less so by the time of ten Cate's presence in Freiburg around 1924-1929. The final result here has been created with such precision that it looks more like a "drawn roll" (created by penciling in the notes before handing it over to the perforator for punching, and, later, mass-copying). At any rate it is an arrangement which was made to conform to the capabilities of Welte's Philharmonie. The use of the "Harp" stop (bells) partially endows the spirit of this Philharmonie performance with that of its origins as a piano work. The roll was issued in 1925-26. Bossi was the first internationally renowned organist to record for Welte, and the only Italian ever to do so. The link was probably made with the company's presence at the Turin exhibition of November 1911: Bossi's son - a German-trained organist - conducted an orchestral concert there with his father as soloist on 31st October. This was the last day of the Exhibition at which the Philharmonie had been presented. Most of Bossi's rolls were released 1912-1914 with just one more each in 1921, 1922 and 1925. It is possible that the 1925 release was commemorative. It is curiously fitting that an organ arrangement of Chopin's famous Funeral March was recorded by Bossi, and is here released on a ship's CD-set, because he died while making an Atlantic crossing and was buried at sea (February 20th 1925). His death was through illness, not misadventure. It is, however, a reminder that sea voyages often involved the problems of illnesses more serious than sea-sickness, or even death on the high seas. 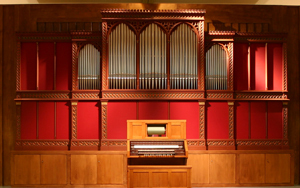 Concert touring for many organists (also e.g. Guilmant, Best, Eddy, Lemare) involved ocean liners in those days rather than aeroplanes - and good health was, as it still is, a safer start to intercontinental travel. Had Titanic ever had a Philharmonie, as might have been intended, or had Britannic ever plied the seas with passengers rather than soldiers, then these organists could well have given on-board recitals. The original recording was made 18th July 1912 or very soon after. This transcription of an orchestral work not only reminds us of the desire for calm seas but also brings in the reminder that sea voyages could also be trade- or profession-oriented and thus generators of wealth. Mendelssohn's work was based on a poem of the same name by the great German writer, Johann Wolfgang von Goethe (1749-1832), first performed in 1832. A cantata of Beethoven's is also based on it. The experiments of James Rumsey (1743-1792) in the USA notwithstanding, this was before the days of steam-powered boats, when being becalmed in a windjammer was almost as bad as any other misadventure. The Welte roll was possibly recorded as early as 20th February 1913, but only released in 1927. The concept of a smooth sea passage has always been desirable to most travelers with the exception of a few "bad-weather" yachties who share a quest for danger and excitement with Swiss mountain rock-climbers and similar adventurous types. In the 19th century when ships lacked efficient stabilizers - windjammers again - they could be becalmed in agonizingly rolling seas or wallow between liquid mountains and valleys whipped up by wind on water. A bad voyage could be a complete nightmare of no progress and acute motion sickness, to say nothing of fear of survival, lasting days or even weeks. That era also had its forms of expressing this in their art-works, including music, or invoking a talisman perhaps by writing music which equated to prayer for deliverance - such as this short arrangement. The original recording is probably from around 1921-22, although possibly from as early as 1912. Here we have one of the great archetypical musical symbols of Wagner - a master of the art who wrote this entire opera based on the ever-rolling ocean and an equally restless sailor. The transcription of this piece onto punched roll was done by Franz Xaver Franz - the Freiburg orchestral musician employed by Welte who not only knew this repertoire and how to play it, but could also make it sound like a completely convincing "live" performance when tracing it out in pencil onto a paper roll. When he had done this, holes were punched into the paper which, after copying, played back operating pneumatic mechanisms, playing notes, changing stops and making all the necessary musical nuances such as crescendos and diminuendos. Franz stands out in his mastery of this unusual craft. It demanded infinite patience and attention to detail, but above all else direct knowledge of the musical style and its paradigms. The original recording was first released in 1921. By late 19th century the great passenger shipping companies were engaged in an increasing commercial battleground for their clients' loyalty. Steam rather than sail, and a good safety record, was a good start to this. Aside from that, days, even weeks at a time on board ship, required nourishment but also demanded comfort and entertainment for the passengers. This was provided from minimal to, for first class passengers, lavish. The more the fare cost, the better was the fine dining - even at the captain's table - comfort, entertainment and on-board privileges (including rescue, if the Titanic was any yard-stick). Music was one of the main distractions, with grand pianos, uprights, player pianos, harmoniums, orchestrions and even bands or small orchestras. The presence of a Philharmonie was considered the utmost available in prestige and entertainment value and, in the case of Britannic, was planned for installation right opposite the grand first-class staircase. This was an object of lavish carving and decoration in itself, virtually identical in all three White Star Line ships, Olympic, Titanic and Britannic. The generation of ship-traveling organ virtuosi played music of all kinds: church music and secular music, including transcriptions of popular classics, opera selections and piano music. Some of them improvised as well. Right at the centre of the entertainment genre at this time, whilst still being original organ music, was French repertoire of the late 19th and early 20th century. Questions have sometimes been raised as to the suitability of Toccatas such as this in a liturgical context, and even more questions as to its intrinsic worth as original organ repertoire with such a perfunctory pedal and so pianistic in style. Yet no question could ever be posed as to its suitability as entertainment. Certainly it would have been a likely choice to play to passengers whose tastes in music would have varied greatly. The Barcarolle was a musical genre associated indelibly with boat travel, its intent was to musically represent the gentle rocking of a (small?) boat in (relatively calm?) water. Certainly a non-violent form of music compared to Storms and Battles. Lemare was a specialist in arranging and performing transcriptions, delving himself quite happily into a great variety from standard organ repertoire to lighter entertainment genres and transcriptions. The music represented here was repertoire well-known across the entire spectrum of musical taste at the time - one of many Barcarolles, some more familiar, some no longer so well-known. The original recording was made around 8th March 1913. A storm at sea aboard Britannic? That could well have been one of two kinds: natural phenomenon or on-board entertainment. The musical Storm was a programmatic genre, an interesting 19th century romantic musical form. In some ways it followed on from another programmatic form: the organ "Battle" of earlier centuries. Linked to the Pastorale and other post-Rousseau "natural" cultures, Storms were also known by other titles, such as the French Orage (also a kind of double entendre hinting at the use of an accessory stop which played low-pitched clusters imitating thunder). Storms were found in both orchestral and organ forms. There is little doubt that this piece would have been played aboard ship, given that an organ was installed, since it was heard everywhere else that secular organ music was performed - especially in concert halls. One of Welte's recording artists was the Swiss organist from Luzern Cathedral, Franz Joseph Breitenbach, who even adapted the genre in one instance to a specifically Helvetian manifestation. Mahler's "Alpine" Symphony was an orchestral equivalent. Probably the most well-known organ Storm was this very popular work by Belgian composer, Jacques-Nicolas (Jaak-Nicolaas) Lemmens. It begins and ends peacefully, as storms do. With the clusters and running scale passages we metaphorically enter the eye of this musical storm. Yet even after it settles down we hear the faint resonance of distant rumbles in some final clusters. This was a much-favored concert item which attracted the masses at such events as Free Sunday Afternoon concerts in British-derivative Town Hall cultures from around mid-19th to mid-20th century. It is still sometimes to be heard. The interpretation of Goss-Custard here is important, since he was born and bred into the midst of this tradition. There is also a surviving early electro-acoustic "78" recording of him playing it. This roll recording was much earlier, around 20th February 1913. Another rocking-boat piece, interestingly played with the slightly irregular rhythms of water lapping against a dinghy or boat of a lighter kind creating a movement which was slightly erratic. The blind British organist and composer, William Wolstenholme, was one of many who ventured pieces in the genre. This is a rare recording of a composer's own performance of one, a gem of its kind. The original recording session commenced 26th September 1913. The main shipping links were also strong trade and cultural ties, to say nothing of their criticality to family bonds as emigration from Europe occurred. Much of this was directed towards North America, South Africa and Australia during the 19th century, especially since parts of Europe were in poverty and North America was developing a reputation as a creator of wealth. But it was the ocean that once again intervened. Masses of water on this scale were always a dangerous element to contend with. More or less than a week or so - depending on whether you were under sail or steam - was needed to traverse the Atlantic from western Europe to South Africa or eastern America. You could, to a degree, take your pick of the Indian or Pacific oceans to Australia or New Zealand, but weeks could then turn into months. This left the USA as the primary destination for most people seeking their fortune or at least a better way of life. The general perception was that the USA offered hope once you had paid for, made and survived your journey. Dvoák managed to express this feeling of looking west, across a restless ocean, with hope and confidence in his justly popular symphony. Significantly, perhaps, one of the main themes of this work has a very similar motivic basis to one from Wagner's Flying Dutchman. This recording is made from a "drawn", or hand-made roll. Unfortunately its creator is not identified, but there are many reasons to believe this was another masterly creation by Franz Xaver Franz. The original recording was released around 1922, but must have been made before 1920 since Franz died in that year. The arrangement is attributed to H. Cady. The original roll recording was probably made 1923-24. The original of this was a piano recording. It was converted to organ roll and re-released as such in 1919. A tribute to the playing of "Hans Häuser"
Hans Häuser is said to have been a pseudonym used by Hans Haas, pianist, director of recording for Welte from 1925 onwards. The evidence for the pseudonym is somewhat scant - mainly in a lingering oral tradition of Welte afficionados. But the use of pseudonyms was quite common, especially when a performer crossed artistic borders, for example when an otherwise famous organist was "moonlighting" in cinemas or playing popular pieces aside from his normal "serious" repertoire. As these five tracks show, "Häuser" was a most capable musician in this particular arena of musical entertainment. A picture of music on a great passenger liner might seem to be complete with the preceding tracks. But not quite. Music at sea also included hymns, but they were not just for shipboard church services: they also served as a kind of "religious folk-music". Apart from Nearer, my God, to Thee (see CD 1 of this pair) there are a number of well-known British hymns which are associated with ocean crossings - the "Sicilian mariners'" tune (posing also as a Christmas tune in Europe: O du fröhliche), O God, our help in Ages past, Eternal Father with its ritornello "for those in peril on the sea", and Abide with me. The last two of these are presented here, completing this "marine musical picture". The text of this "sea-faring" hymn - written as a poem by William Whiting in 1800 for a student about to sail for north America - reflects back to the opening remarks above where fear of shipwreck or sinking was a major component of, and constant accompaniment to any sea-voyage. Each verse typically ends with the words "Oh, hear us when we cry to Thee,/For those in peril on the sea". Fear was also felt by those left behind - family, friends, wives and children. This musical setting was composed by J.B. Dykes and dates from 1861. He named the tune Melita after the island (now called Malta) that the Apostle Paul reached after his ship sank. The preservation of about 25 German and English hymns in the Seewen roll-collection is an intriguing feature. That the Berlin Chorale and British Hymn traditions of around 1912 were also recorded for posterity may seem a little odd to today's more secular world. But the symbolic power of hymnody, traditions of community hymn-singing, potential sales and sheer practicalities encouraged Welte to represent this precious musical niche in their catalogues. Here Goss-Custard provides an interesting souvenir, even revelation, into how four verses of this hymn might have been played in England pre-First World War. His original recording session began on 20th February 1913. The text of Abide with me was by Henry F. Lyte in 1847, the music (the tune named Eventide) by W.H. Monk in 1861.